With a quick shot of Krylon, our wheels were ready for rally. 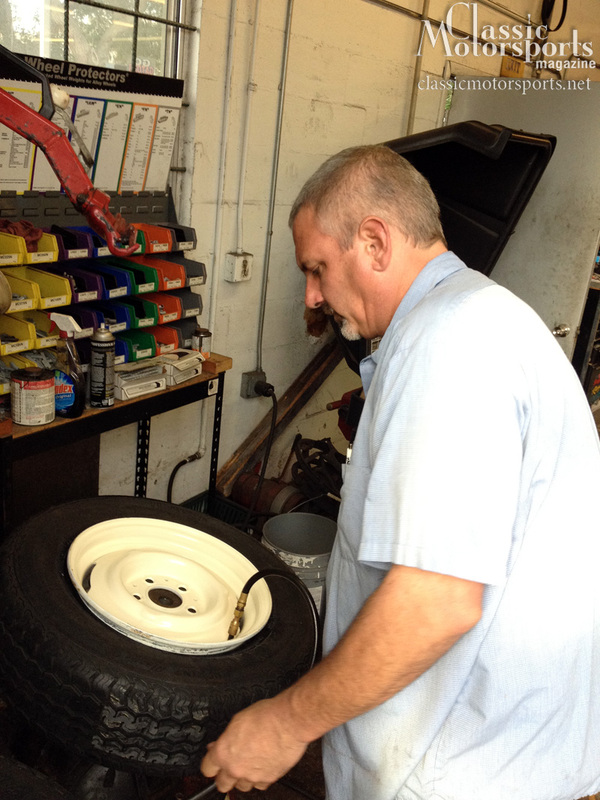 Geoff Thompson of Andre’s Automotive expertly mounts and balances our new tires and wheels. To keep this project completely upscale, we then went to Walmart, picked up three cans of off-white Krylon combination paint and primer, and painted the wheels. The previous owner told us he had brought our 1966 Mercedes-Benz 230 S from Colorado to Florida less than a year ago. The studded snow tire used as a spare in the trunk and the Blizzak snow tires on the rear of the car certainly supported this claim. We would need something a little different in Florida. 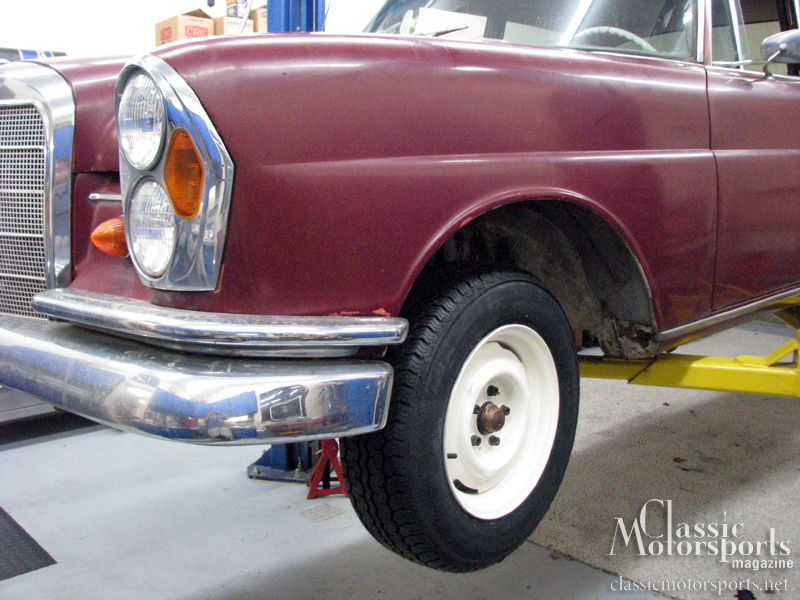 A 1966 Mercedes 230S would have come with 13-inch wheels. 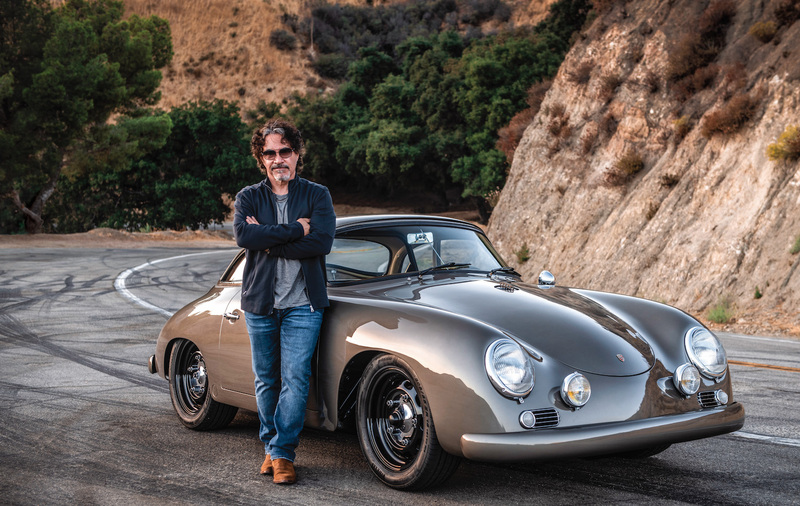 Some time along the way, this car had been converted to 14x6-inch steel wheels. While not original, we saw this as a worthwhile upgrade. We pulled the wheels, took them to our buddy John Purner—owner of Complete Custom Wheels—and ran them through his amazing wheel sandblasting machine. In just a few minutes, he had all four wheels stripped to bare metal. To keep this project completely upscale, we then went to Walmart, picked up three cans of Krylon off-white paint and primer combined and painted the wheels. Fifteen dollars later, we had 14x6-inch vintage rally looking wheels. On these wheels we mounted a set of Vredestein Sport Classic tires, available from places like Universal and Coker Tire. We have found cheaper tires, but we really like the look and feel of these Vredesteins on our old cars. Not only do they look perfect on a car from the sixties, but they ride and handle surprisingly well. We thought this tire, in the 195/70R14 size was the perfect complement to the vintage rally look we were going for on this beast. One ride around the block convinced us yet again that we had a winner with the Vredesteins. They just make these old cars drive right.